The concept of nuclear disarmament as an essential condition for nuclear nonproliferation is again entering the realm of practical politics, but the movement toward nuclear disarmament is extremely difficult and fraught with great dangers. 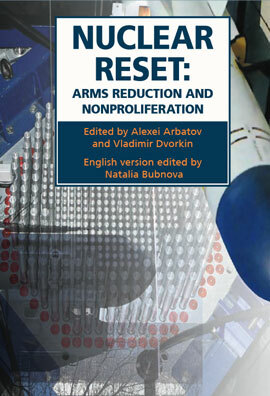 Nuclear Reset: Arms Reduction and Nonproliferation, a collective study edited by Alexei Arbatov and Vladimir Dvorkin (English version edited by Natalia Bubnova), addresses the multifaceted and complex issues of present-day nuclear weapons and their foreseeable development. The continued image of nuclear arms as an indispensable pillar of superpower security combined with the absence of progress on the issue of nuclear disarmament spurs the risk of nuclear proliferation and eventually military or terrorist use of nuclear arms. Nuclear Reset: Arms Reduction and Nonproliferation refutes the argument put forward by many politicians and experts, both in Russia and internationally, of a “civilizing effect” of nuclear weapons in international relations—implying nuclear states’ restraint in their foreign and military policies in the face of fears of nuclear catastrophe. The book argues that after decades of heated debate the concept of nuclear disarmament as an essential condition for nuclear nonproliferation is again entering the realm of practical politics. Since genuine and consistent movement toward nuclear disarmament is extremely difficult and fraught with great dangers; realism and professionalism is required, taking into account all of the subtleties and the political, economic, military, and technological interrelationships around the issue. The book suggests that in this context there is a need for thorough and well-grounded linkage of all of the elements of the process and both its bilateral and multilateral formats. I would certinly consider buying it as I did with a publication of yours in the 2011 meeting. It appears to be a seminal study. I met Alexei at a Harvard Columbia seminar at Arden House when there were jointly sponsored seminars.I also visited the old Institute of the U.S. A. and Canada "Institut S Sha a i Kanady in July, 1976 on my first trip to the U.S. S. R.-SSSR in July, 1976 with the then Citizen Exchange Corps -"Korpus Obmyen Grazdanami".I like about a day 7days etc.I hera from trenin po russkii.Kak uzhasno. How unfortunate that I have to miss the meeting but good luck vsevo khoroshevo!